Wildlife photographer Jim Brandenburg captures the beauty and intensity of wolves in the wild in these four designs. The Defenders Wolves series includes checks, address labels. a contact card and a matching leather checkbook cover. The Check Gallery proudly supports Defenders' efforts to protect all native wild animals and plants in their natural communities. Defenders of Wildlife - Wolves Contact Cards offer a handy way for family, friends, classmates and coworkers to stay in touch with you. With up to six lines for your personal information, Contact Cards are sold in sets of 150 and measure 3.5" x 2". The Check Gallery proudly supports Defenders' efforts to protect all native wild animals and plants in their natural communities. You'll benefit from the convenience of our self-adhesive Defenders of Wildlife Wolves Return Labels. Conveniently bound in books, just like your checkbook, our return address labels are sold in sets of 200 and offer up to 4 lines of personalization. The Check Gallery proudly supports Defenders' efforts to protect all native wild animals and plants in their natural communities. 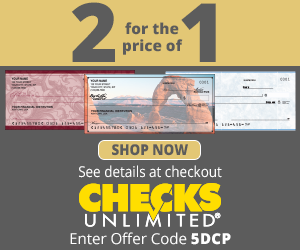 Complement your Check Gallery check order with our Defenders of Wildlife Wolves Leather Checkbook Cover. This high-quality personal checkbook cover will accommodate your favorite checks with pockets for your check register ID photos and more. The Check Gallery proudly supports Defenders' efforts to protect all native wild animals and plants in their natural communities.